Not to be confused with Kintra. Kentra is a hamlet overlooking the east coast of Kentra Bay, on the north east end of the Ardnamurchan peninsula near Acharacle, Scottish Highlands and is in the Scottish council area of Highland. 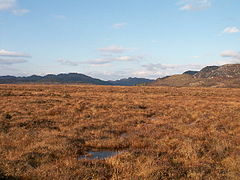 Kentra Moss near Kentra. Kentra Moss looking north. Very flat. The small hamlet of Ardtoe is located 1 miles northwest along the B8044 road and is accessible from the A861 road from the east at Acharacle. ^ Gittings, Bruce; Munro, David. "Kentra". The Gazetteer for Scotland. School of GeoSciences, University of Edinburgh and The Royal Scottish Geographical Society. Retrieved 17 August 2018. This article about a Site of Special Scientific Interest in Scotland is a stub. You can help Wikipedia by expanding it.